ANASA-managed rocket launched two experimental satellites designed to track ballistic missiles Friday in a test flight for the United States MissileDefense Agency. 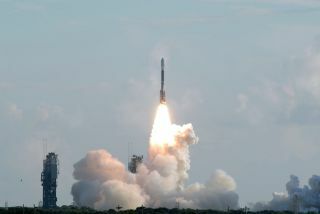 The Delta 2rocket blasted off at 8:20 a.m. EDT (1220 GMT) from the Cape Canaveral Air ForceStation in Florida carrying two Space Tracking Surveillance System (STSS) satellites on atechnology demonstration mission. They reached orbit just under an hour later. "Withconfirmation of the payload's delivery into the correct orbit, the launch is asuccess," said Omar Baez, launch director for NASA?s Launch ServicesProgram headquartered at Kennedy Space Center, in a statement. The launch wasdelayed by two days due to weather and technical glitches. The two STSSdemonstration satellites form part of the Missile Defense Agency?s layeredBallistic Mission Defense System. They are designed to demonstrate the abilityof tracking ballistic missiles in every stage of flight, something U.S.space-based assets cannot currently do. "The STSS DEMO mission is important to ournation's defense,? said Air Force Brig. Gen. Edward L. Bolton Jr., 45th Space Wingcommander. ?Our team continues to work hard to ensure we are doing all we canto provide the support needed for such important missions to occur." Thesatellites were originally built by Northrop Grumman for an earlier flightdemonstration program that was scrapped in 1999. The project was revived in2002 when the Missile Defense Agency (MDA) awarded Northrop Grumman an $868 million contract to ready the satellites for launch.To date, $1.5 billion have been spent on the project. "Eventhough the hardware was built in the 1990s, when the two STSSdemonstrators are on orbit, they will bring aunique capability to the MDA," Gabe Watson, Northrop Grumman's STSSprogram manager, told SPACE.com in June. "We can track missiles in everystage of flight, from launch to intercept, and do hit assessment as well. Ifthe MDA wants to intercept missiles in the ascent phase, they will needadditional data that [current missile warning satellites] don't provide." The STSSsatellites follow NASA?s launch of another missiledefense satellite - the STSS Advanced Technology Risk Reduction spacecraft -in early May. They weigh about 5,000 pounds (2,267 kg) and are equipped with astaring sensor similar to those used on other Air Force defense satellites. Butthey also carry a multi-band infrared sensor to track missiles. At leasttwo tests of the STSS system are planned using dedicated missile launches tocheck the satellites? performance. They may also play a role in two other testswith other defense systems such as the Aegis Ballistic Missile Defense system, STSSprogram officials have said. The newSTSS satellites are expected to undergo a three-month checkout phase byNorthrop Grumman, which will operate them from the Schriever Air Force Base inColorado. A six-month test period is expected to follow. Congresshas not yet approved any funding for an operational version of the missiledefense satellites, though military officials may pursue funds to begin thatwork in 2011 if the STSS demonstration satellites prove to be effective.